Hey these are really nice..they look wonderful...thanks for sharing them with us...and well also drop by my blog on Birthday Greetings sometimes and check out all that i've posted there!!! Love these tins! I too have been wanting to do one, but haven't done it yet. I'm looking forward to meeting you in a few weeks. I'll be at the Arlington gathering too! I just figured out my card yesterday and today I need to order the rest of the stuff I need for it! Can't wait to see what you come up with! These turned out GREAT! I've never made one of these, but it looks like a lot of work. Have a great Easter!!! Wow, these came out great! I love how they turned out! What a wonderful gift to receive! I enjoy seeing your work every day. Kendra...these are GORGEOUS!!! They totally put the one that I did recently to shame! As always, you are a true inspiration. 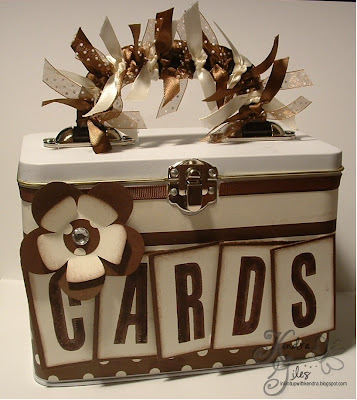 Awesome card tins!! Your co-worker will love them! I love the big letters, blooms, and lotsa ribbon!! 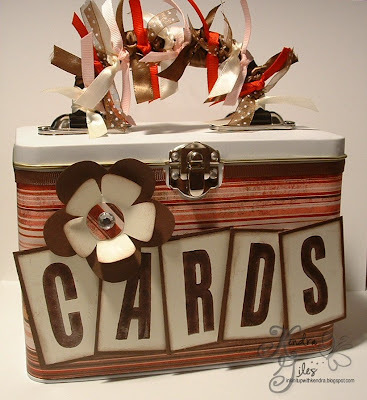 ...and your creativity just keeps on going...and going...and going...and going...beautiful tins! Wow! I love the chocolate and white! These are soooooooo cute! I'm very impressed with all you're accomplishing. You're inspiring to say the least!